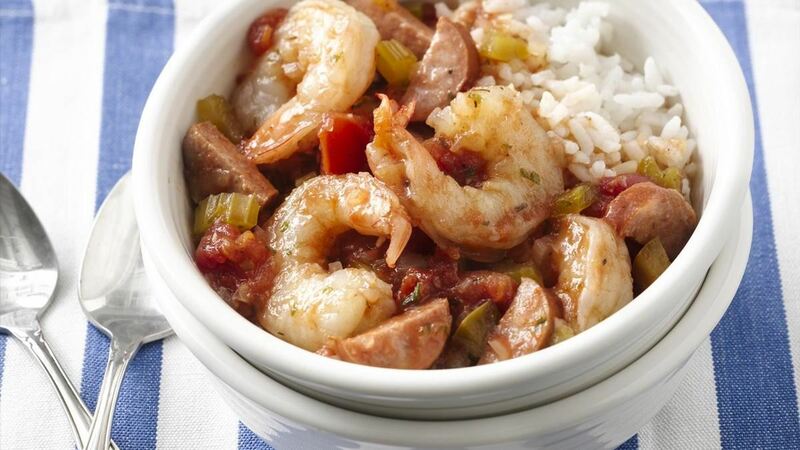 In 3 1/2- to 6-quart slow cooker, mix all ingredients except shrimp and rice. Stir in shrimp. If needed, reduce heat setting to Low; cover and cook on Low heat setting about 1 hour longer or until shrimp are pink and firm. Serve jambalaya with rice. This recipe was tested in slow cookers with heating elements in the side and bottom of the cooker, not in cookers that stand only on a heated base. For slow cookers with just a heated base, follow the directions from the manufacturer for layering ingredients and choosing a temperature. Special Touch: Heat up this Cajun favourite by sprinkling with more red pepper sauce just before serving. If you want to use fresh parsley and thyme, add them with the shrimp so the flavour isn't lost during the long cooking. Substitution: Spicy and smoky, andouille sausage is traditionally used for this dish. If you're in a more mellow mode, leftover ham works just as well. Serve With: Spray the inside of a 1/2-cup measuring cup with cooking spray. For each serving press the hot rice into the cup. Place the cup upside down in the bottom of a bowl, and unmold the rice. Spoon the jambalaya around the mound of rice. Serve with warm crusty French bread.